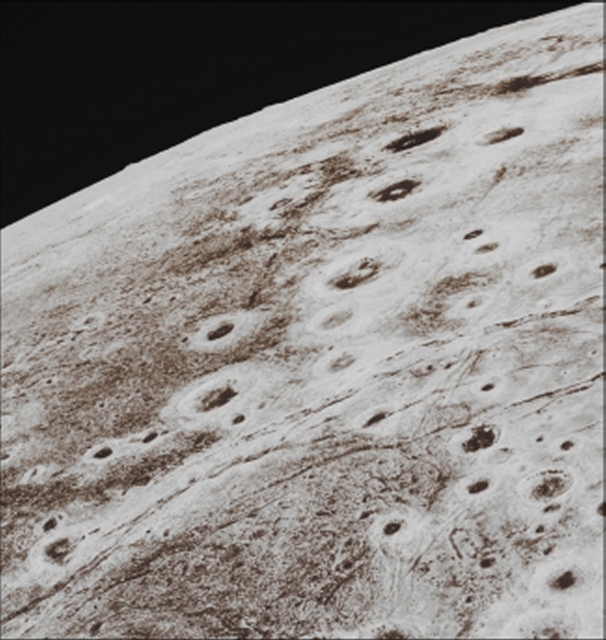 This beautiful frame is a crop obtained from an High-Resolution image-mosaic (see yesterday's APOD) of the Dwarf-Planet Pluto and it shows us a portion of the frozen Cratered Plains located to the West of the NASA - New Horizons Spacecraft's encounter Hemisphere. We can also see a number of simple and complex (here and there, even sinuous) Faults (watch the central/lower portion of the frame) and, last but not least, a few Vertical Reliefs (Mountains), that are well visible right on the Limb of Pluto. The pictures used to create the Original image-mosaic were all taken by the Long Range Reconnaissance Imager (LORRI) in a so-called "Ride-Along Mode", with the LEISA Spectrometer. Taken shortly before New Horizons' July 14th, 2015, closest approach to Pluto, details as small as roughly 500 yards (such as about 457,2 meters) can be seen. The image (which is a crop obtained from an Original NASA - New Horizons Spacecraft's b/w and NON Map-Projected image-mosaic published on the NASA - Planetary Photojournal with the ID n. 20286) has been additionally processed, extra-magnified in order to better see the details, contrast enhanced and sharpened, Gamma corrected and then colorized (according to an educated guess - or an informed speculation, if you wish - carried out by Dr Paolo C. Fienga-LXTT-IPF) in Absolute Natural Colors (such as the colors that a normal human eye would actually perceive if someone were onboard the NASA - New Horizons Spacecraft and then looked outside, toward the Dwarf-Planet Pluto), by using an original technique created - and, in time, dramatically improved - by the Lunar Explorer Italia Team.